The Kuala Lumpur homes of the two pilots of missing Malaysia Airlines plane that vanished on March 8 with 239 people on board are being searched by police. 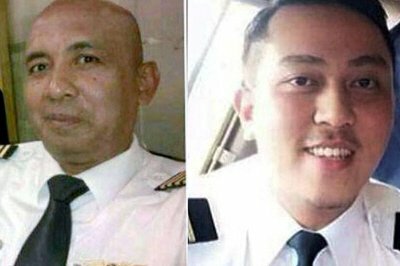 Malaysian police are also reportedly looking at the family life and psychological state of pilot Zaharie Ahmad Shah, 53, and co-pilot Fariq Abdul Hamid, 27. This comes after the authorities said the communications systems of the plane had been deliberately disabled. The Kuala Lumpur-Beijing flight is believed to have then changed course. According to satellite evidence, the Boeing 777 could have continued flying for a further seven hours after its last radar contact, Malaysian PM Najib Razak said. He added that the plane could be anywhere from Kazakhstan to the Indian Ocean. Najib Razak stopped short of saying it was a hijacking, saying only that they were investigating “all possibilities”. In a separate development, India on Sunday suspended its search for the plane around the remote Andaman and Nicobar Islands and also in the Bay of Bengal. Delhi said it acted at the request of the Malaysian authorities. China – which had 153 citizens on board flight MH370 – has urged Malaysia to continue providing it with “thorough and exact information” on the search. The homes of Zaharie Ahmad Shah and Fariq Abdul Hamid were searched on Saturday, a senior police officer familiar with the investigation was quoted as saying by Reuters. “We are not ruling out any sort of motivation at the moment,” the official said. The authorities have so far released no new details on the pilots’ investigation. However, nothing has been ruled in or out – so terrorism, piracy or even an elaborate suicide are all options now being considered. Zaharie Ahmad Shah joined Malaysia Airlines more than 30 years ago, and was considered a very experience pilot. Fariq Abdul Hamid recently graduated to the cockpit of a Boeing 777. It is believed that he was considering marriage. It was also reported that Fariq Abdul Hamid had drawn scrutiny after he and another unnamed pilot invited two female passengers to sit in the cockpit during a flight in 2011, according to the Associated Press. Flight MH370 left Kuala Lumpur for Beijing at 00:40 local time on March 8 and disappeared off air traffic controllers’ screens at about 01:20. PM Najib Razak told a news conference on Saturday that new satellite evidence shows “with a high degree of certainty” that the one of the aircraft’s communications systems – the Aircraft and Communications Addressing and Reporting System (ACARS) – was disabled just before it had reached the east coast of Malaysia. ACARS is a service that allows computers aboard the plane to “talk” to computers on the ground, relaying in-flight information about the health of its systems. Shortly afterwards, near the cross-over point between Malaysian and Vietnamese air traffic controllers, the plane’s transponder – which emits an identifying signal – was switched off, he said. A satellite was able to pick up a signal from the plane until 08:11 local time – more than seven hours after it lost radar contact – although it was unable to give a precise location, Najib Razak said. Investigators will now focus on trying to obtain the radar data from any of the countries the Boeing 777 may have passed over. This could include Thailand, Myanmar, Nepal, Bangladesh, Bhutan, China, India and Pakistan. Along with the Chinese passengers, there were 38 Malaysians and citizens of Iran, the US, Canada, Indonesia, Australia, India, France, New Zealand, Ukraine, Russia, Taiwan and the Netherlands on board.